The Chartteam is slowly crawling out from a power-less lower Manhattan and water-logged New Jersey to find that we’ve been, all in all, incredibly lucky to be spared the worst from the wrath of Hurricane Sandy. Every one of us is safe and every one of our thoughts go out to our neighbors who weren’t so lucky. We’re just now poking our heads out to assess the real impact of the past few days. For that, we turn to the media for the details we can’t see first hand. 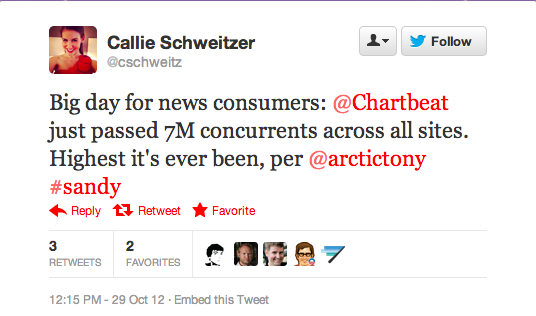 Sure Twitter and Facebook, too, to share and learn quick snippets in real time, but for the true impact, the fact from the fiction, we (and much of the country it seems) spent the better part of this week turning to major publishers, local news outlets more than we at Chartbeat have seen…ever. We saw well over 7,000,000 concurrent visits and sky-high engaged time across all of the sites within the Chartbeat Universe – so people were not only hitting pages to check the most breaking news, but also stayed there, their attention glued to the stories. Which is even more mind-blowing, as for the most part, Sandy only affected the US east coast. In less than a week, we’ll be watching the impact and attention of an event that dramatically affects the entire country, the entire world. If Sandy broke records like this, it’ll be an interesting time to place some bets on the kind of traffic and engagement the Presidential Election will drive. Any guesses?